Quick reminder of the rules for the Cinderella Tournament – it is single elimination, each match has a ten minute time limit, and a wrestler can also win by throwing their opponent over the top rope. If a match ends in a Draw, both wrestlers are eliminated from the tournament. Now that I have finished all the profiles, every wrestler above has one on the website, you can click on their names above for more information on the wrestler. 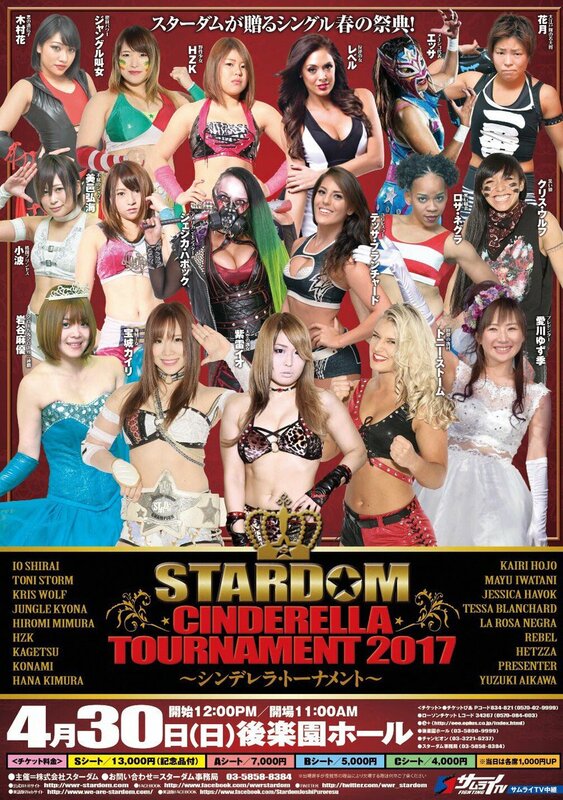 As I am (obviously) watching this on Stardom World, all matches will be shown in full. Lets get to it! This was billed as a “dark match” but since I am watching it I guess it wasn’t a dark match in the traditional use of the term. This is basically every contracted wrestler that didn’t get into the tournament (aka the babies) and Kaori Yoneyama (aka the babysitter). Hanan and Ruaka are only 12 years old and recently debuted, while AZM is inexplicably a title holder in Stardom but still can’t get into the tournament, likely because she is 14. AZM acts at first like she is on Kaori’s side against the rookies, but instead attacks her as the veteran is triple teamed. She hits a jumping crossbody on all of them for their trouble, AZM grabs Kaori but they are both dropkicked over by Hanan and Ruaka. This leaves the two 12 year olds alone in the ring, judo throw by Hanan and they trade holds on the mat until Ruaka throws Hanan off of her. Kaori and AZM return, AZM dropkicks Kaori but Kaori bridges out of the pin. AZM returns the favor but Kaori catches her crossbody attempt and drops AZM on the ground. Ruaka and Hanan trip Kaori and all three dropkick her while she is in the ropes before the rookies pose on her. AZM takes advantage of this and attacks both rookies, Hanan dropkicks Ruaka and then AZM dropkicks Hanan, all four wrestlers trade schoolboys but no one gets the three count as they return to their feet. AZM has had enough and sits on the top turnbuckle to watch, STO by Hanan to Ruaka but Kaori dropkicks her while hitting a senton on Ruaka at the same time. AZM jumps down to break up the cover but soon returns to the turnbuckle, Kaori wraps up Hanan’s legs but AZM comes down again and puts Kaori in a hanging armbar. AZM yells for Ruaka and they double team Kaori, AZM gets on the second turnbuckle but Ruaka hits a Fisherman Suplex Hold on Kaori before AZM can jump off. Hanan sneaks in a cover on Kaori which AZM also breaks up, AZM and Hanan trade elbows until Hanan hits another STO. Hanan goes for a toss on Kaori but Kaori blocks it, she lays all three of her opponents next to each other and goes for a diving senton, but all three roll out of the way. Satellite schoolboy by AZM to Kaori but it gets a two count, Ruaka boots AZM in the corner as Hanan recovers, but Kaori drop toeholds Hanan on Ruaka. Kaori goes for a senton on both of them but Hanan rolls out of the way, so Kaori only hits Ruaka. Hanan quickly schoolboys Ruaka, and she picks up the three count! Hanan is the winner! This is the first win of Hanan’s career. A pretty well structured match, rookie matches can be all over the place but clearly they planned this match well and no one ever looked lost. There were some minor things here and there but nothing match-breaking, and all four wrestlers got a chance to shine a bit since it was a decent length opener. Not a bad way to kick things off. This match is in the 1st Round of the Cinderella Tournament. 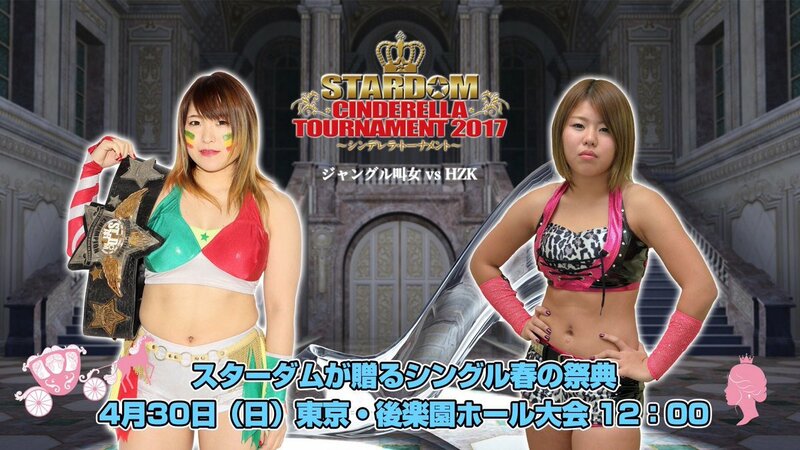 This is actually a pretty big match, as HZK and Kyona are both early in their careers and looking to move up the card. Both have a title (Kyona with the tag belt and HZK with the trios belt), and both have aspirations to get a singles championship sooner than later. Neither really has the edge going into the match, and with the Over the Top Rope rule anything can happen. They immediately charge each other to start and HZK connects with a few kicks, but Kyona shrugs them off and the two trade elbows. Kyona applies a sleeper and swings HZK around, she tries to throw HZK over the top rope but HZK lands on the apron. HZK goes off the ropes but HZK avoids her shoulder tackle and kicks Kyona back into the ring. HZK goes up top but Kyona joins her, she tries to push HZK out of the ring but HZK hangs on. Kyona powerslams HZK back into the ring, she returns to the top turnbuckle and delivers a diving body press for a two count. She goes for a gutwrench but HZK quickly gets out of it, elbows by Kyona but HZK pulls her down by the hair and hits a series of mounted elbows. HZK picks up Kyona but Kyona palm thrusts her, Codebreaker by HZK and she slams Kyona in front of the corner. HZK goes up top but Kyona recovers and slaps her, Kyona grabs HZK and she goes for a powerbomb, but HZK pushes off of her and kicks Kyona in the head. She goes for the Full Nelson Slam but Kyona blocks it and hits a lariat, both wrestlers go for quick pins but neither gets the three. Kyona is up first and goes off the ropes, but HZK knees her. Lariat by Kyona but HZK connects with the jumping front kick, HZK slams Kyona in front of the corner and she nails the Bombs Away for the three count! HZK wins and advances in the tournament. This match is in the 1st Round of the Cinderella Tournament. Jessicka Havok is the latest Monster Gaijin For Io To Defeat One Day to come to Stardom, this is her first tour with the promotion. Natsuko wasn’t supposed to be in the tournament, but was a late replacement when La Rosa Negra had to pull out. Natsuko will likely be slaughtered here but its for The Greater Good. Natsuko attacks Havok before the bell rings, but Havok absorbs her punches and knocks Natsuko to the mat. Clubbing blows by Havok, she goes for a lariat but Natsuko blocks it and applies a guillotine. Havok tosses her off and charges Natsuko, Natsuko ducks and tries to toss Havok over the top rope, but Havok easily blocks it. Havok chokes Natsuko but Natsuko gets away, she goes off the ropes but Havok boots her in the face. Havok gets Natsuko on her shoulders but Natsuko slides down her back, Havok tries to sit on Natsuko but Natsuko moves and rolls up Havok for two. Havok tosses Natsuko in the corner but Natsuko avoids her charge and schoolboys her again for a two count. Elbows by Natsuko and a dropkick, she goes off the ropes but Havok knees her in the stomach. Lariat by Havok, she picks up Natsuko and drops her with a tombstone piledriver for the three count! Jessicka Havok advances in the tournament. As odd as it may sound, I think Natsuko got too much “offense” in this match. Havok was made to look like a fool for most of it, as the rookie over and over was getting out of her moves or avoiding them, as if she had done weeks of scouting even though she just was put in the match the day before. I’d rather have had Havok just crush her, instead 75% of the match was Natsuko successfully avoiding Havok. The right person won, but I don’t think the structure of it did anyone any favors. 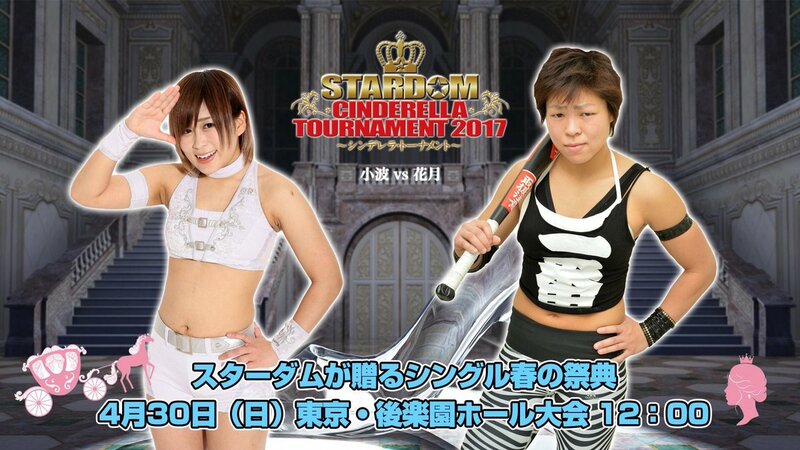 This match is in the 1st Round of the Cinderella Tournament. 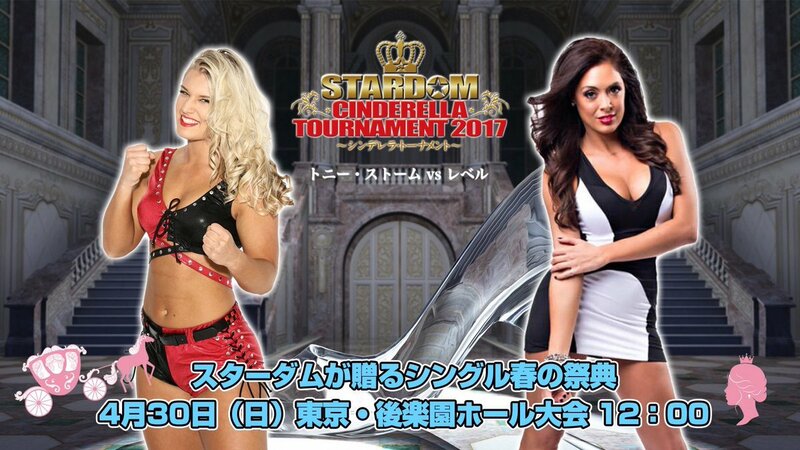 This is Tessa’s first run in Stardom since her successful tour last summer, when she reached the Finals of the FIVE STAR GP. Kris Wolf is the current High Speed Champion, she isn’t quite on Tessa’s level due to Tessa’s past success but Kris has improved a lot in the last six months so its not too lopsided of a match. After some Fast Paced Action, Kris hits a Backstabber before hitting a jumping knee in the corner. Wolf chokes Tessa with her tail before straddling Tessa in the corner and dropkicking her in the… lower stomach area. Very low. Tessa is annoyed by this and elbows Kris repeatedly, she gets Kris in the corner and delivers a modified Codebreaker. Irish whip by Tessa but Kris hits a tilt-a-whirl slam, Kris gets on the second turnbuckle but Tessa recovers and throws her off. Tessa now goes up top and nails a Diving Codebreaker, picking up the three count! Tessa Blanchard advances in the tournament. Here is where things go off the rails a bit, not only due to the time limit but due to the fact Stardom has so many matches on the card that some have to be super short. Since Kris is a champion in Stardom, she deserved a bit better than losing in two minutes, which is shorter than your average veteran vs. rookie match. Not only is it not enough time to do much, but having Tessa pin a champion so easily (and with no interference/cheating/etc.) doesn’t do Kris any favors, at least have her win by tossing Kris over the top since that protects the losing wrestler a bit. I liked some of the spots and the action was fine, just not anywhere near long enough. This match is in the 1st Round of the Cinderella Tournament. 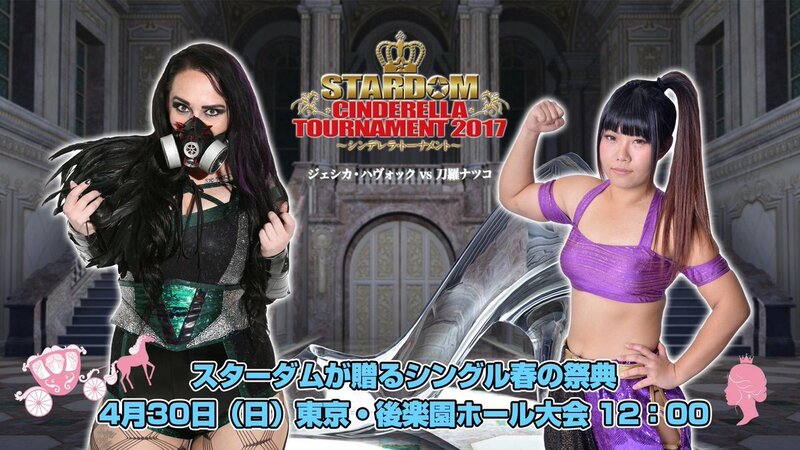 These are two of my current favorite Joshi wrestlers, so of course they are facing off in a time limited tournament match. Konami has been active in Stardom just for the last few months but has already had an impact, having high end matches with all of the promotion’s biggest stars. Kagetsu announced she will be taking a hiatus after this tournament ends but didn’t say for how long, so this may be the last time we see these two in the ring together for awhile. They circle each other to start, seemingly in no rush to engage, Konami kicks Kagetsu to a seated position before kicking her in the back. Konami sits down to let Kagetsu kick her back, but instead Kagetsu elbows her in the head and rakes Konami’s eyes. Dropkick by Kagetsu and she kicks Konami into the ropes, she gets a quick drink of water before spitting it into Konami’s face. Kagetsu picks up Konami but Konami kicks her repeatedly in the chest, Konami goes for a dropkick but Kagetsu slides out to the apron. Kagetsu goes for a swandive move but Konami kicks her as she enters the ring, running kick by Konami and she covers Kagetsu for two. Konami goes for the cross armbreaker but Kagetsu muscles out of it, short armbar by Konami and she then puts Kagetsu in a seated armbar. Kagetsu gets to the ropes for the break, kicks by Konami and she delivers the Fisherman Suplex Hold for two. Konami goes for a kick but Kagetsu ducks it and applies a Wing Clutch Hold for two. Kagetsu gets the piece of luggage but puts it down when the referee sees her, Konami goes for a kick to the chest but Kagetsu holds up the luggage and Konami kicks it by accident. Schoolboy by Kagetsu, and she picks up the three count! Kagetsu wins and advances in the tournament. Unlike Kris, unless Konami lost quickly via shenanigans and wasn’t cleanly pinned, giving her a bit of a break even if she did lose in under five minutes. Lots of kicks here, which can be expected, but it didn’t really have time to get going before it was over. Overall just a forgettable match. This match is in the 1st Round of the Cinderella Tournament. 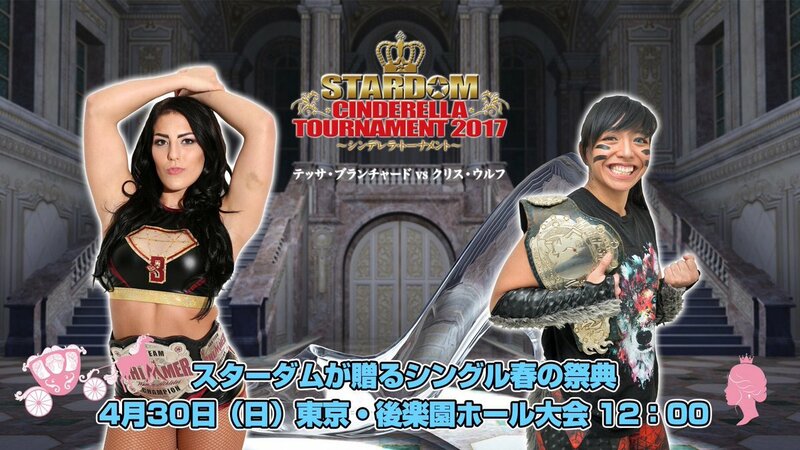 This is Hetzza’s first tour in Stardom, she is a young wrestler from WWS (in Mexico) and she will be in Stardom for three months. She is still really green, so hopefully she gets a lot of valuable experience. Mayu is one of the favorites to win the tournament as she won the last two, shouldn’t have any issues here against the young Luchadora. After a polite handshake, Mayu kicks Hetzza but Hetzza quickly rolls her up for two. They trade flash pins with neither having any luck, dropkick by Hetzza and she puts Mayu in a stretch hold. Mayu gets to the ropes to force the break, Hetzza starts working on Mayu’s arm in the ropes but Mayu dropkicks her. Hetzza gets Mayu in a sunset flip for two, kick by Mayu and she kicks Hetzza again in the head for a two count cover. Mayu goes up top and she nails the frog splash, picking up the three count! Mayu Iwatani advances in the tournament. This result was never in doubt, although it was even shorter than expected. Not much to say about a two minute match, however Mayu sold the hell out of that sunset flip. This match is in the 1st Round of the Cinderella Tournament. Rebel is best known for her work in TNA, she is 38 years old but has only been wrestling for a couple years. This is her first match in Stardom and in Japan in general, so she is new to the crowd (unless they watch TNA, which is doubtful). Toni Storm is an incredible 21 year old wrestler and the current SWA Women’s Champion, as well as my favorite to win the tournament. A tough first draw for Rebel in her Stardom debut. Storm quickly gets Rebel to the mat with a headlock, Rebel gets out of it however and they return to their feet. Storm takes Rebel down again but Rebel struggles back up, wristlock by Rebel but Storm gets out of it and goes back to the headlock. Riveting offensive display for a four minute match. Now it is Rebel with the headlock, Storm Irish whips out of it but Rebel shoulderblocks her to the mat. Storm trips Rebel and hits an uppercut, snapmare by Storm and she hits a few hip attacks for a two count cover. Rebel knees Storm and throws her down by the hair, Space Rolling Elbow by Rebel and she rides Storm in the ropes. Rebel chokes Storm in the corner but Storm avoids the second Space Rolling Elbow attempt and hits a Backstabber. Storm goes for the piledriver but Rebel blocks it, high kick by Rebel and she hits a scoop slam. Rebel goes to the second turnbuckle but Storm avoids the moonsault, Gedo Clutch by Storm and she gets the three count! Toni Storm wins and advances in the tournament. You’d think a four minute match would be action packed, but this certainly was not. They kept Rebel protected, which is good I guess if she hangs around, but the first half of the match had the same buildup as it would if they were going 20 minutes. Just no heat/sense of urgency/etc. from either wrestler, and not overly eventful. It wasn’t necessarily bad, just really dry and not worth watching. This match is in the 1st Round of the Cinderella Tournament. While their ages are similar, Hiromi and Kairi are on totally different levels. 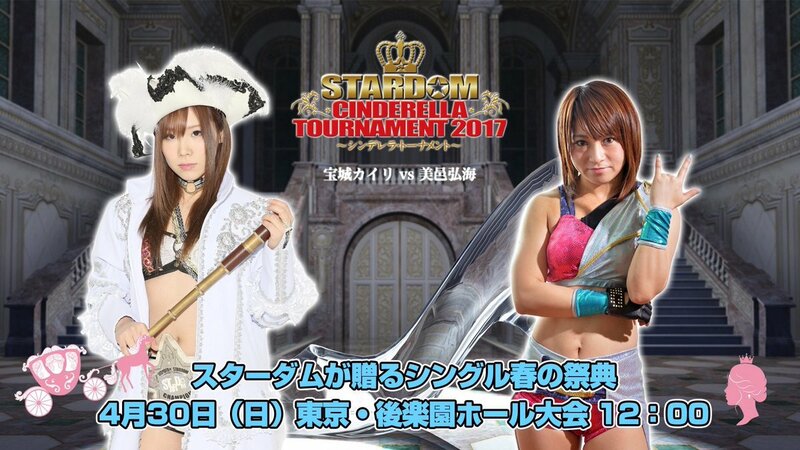 Kairi comes into the tournament as the Wonder of Stardom Champion, which she has held for almost a year. Hiromi has been wrestling for only about a year and a half but hasn’t progressed past the midcard, she is somewhat of a comedy act as she is small and cute but doesn’t have near Kairi’s talent. Still, they are a tag team and seem to be on pretty good terms, so I expect Kairi to be pretty gentle on her friend. Hiromi tries to attack Kairi before the bell rings but she misses, as Kairi avoids several of her opening dropkicks. Hiromi manages to roll up Kairi a few times but only gets two counts, elbows by Hiromi and she hits Kairi with more of them as Kairi lands in the corner. Kairi charges Hiromi but Hiromi avoids her charge and sneaks in a sunset flip for two, dropkick by Hiromi and she applies the rolling leglock. Kairi inches to the ropes and forces a break, Hiromi charges Kairi but Kairi tosses her out onto the apron. Kairi joins Hiromi and hits a Sliding D while still on the apron, but Hiromi doesn’t fall to the floor. Kairi picks up Hiromi and chops her while she is in the ropes, which eventually sends Hiromi back into the ring. Kairi goes up top and hits the diving elbow smash, cover by Kairi but it gets a two count. Crab hold by Kairi but Hiromi gets to the ropes, Kairi jumps on Hiromi’s back and scoop slams her to the mat. She goes for another Sliding D but Hiromi avoids it and quickly rolls up Kairi for two. Jumping DDT by Hiromi, she goes up top and hits a diving crossbody before quickly putting Kairi in La Magistral, but Kairi gets a shoulder up. Hiromi for another DDT but Kairi pushes her off and nails a spinning chop to the face. Kairi picks up Hiromi but Hiromi gets out of the Alabama Slam and rolls up Kairi for two. Elbows by Hiromi but Kairi hits a spear, Alabama Slam by Kairi in front of the corner and she nails the Diving Elbow Drop for the three count! Kairi Hojo wins and advances in the tournament. This match is in the 1st Round of the Cinderella Tournament. The match we have all been waiting to see! Well, me anyway. Io Shirai is the current Stardom champion, best in the world, and is still getting better. Hana Kimura is just one year into her career but has done a great job creating a character in Stardom as she is already one of the crowd favorites. Skill-wise, this isn’t even either, but Io has been known to be “giving” to younger wrestlers so I am anticipating an entertaining match between the two. Hana does her normal dance before the match starts, but when she gets towards the ropes, Io comes up from behind and tries to throw her out of the ring for a quick win. Hana manages to hang on, backflip by Io and she dropkicks Hana to the mat. Io does her handstand walk kneedrop, cover by Io but it gets a two count. Hana takes off her belt and chokes Io with it, she sets up Io and puts her in the Muta Lock. She releases the hold after a moment, Hana charges Io in the corner and hits a double knee strike followed by a dropkick for two. Hana picks up Io but Io blocks the suplex and gets back to her feet. Hana and Io trade running strikes, Hana finally hits the vertical suplex before covering Io for two count. Hana boots Io in the face while she is against the ropes, but Io barely kicks out of the cover. Hana goes up top and delivers a missile dropkick, but Io again gets a shoulder up on the pin attempt. Hana goes off the ropes but Io catches her boot attempt and hits a dragon screw, Io charges Hana in the corner but Hana avoids her charge and tosses Io onto the apron. Io almost falls to the floor but hangs on, Hana tries to boot her off but Io hits a dragon screw in the ropes. Io hops up and hits a swandive missile dropkick, cover by Io but it gets two. Double underhook facebuster by Io, she goes up top and she nails the moonsault for the three count! Io Shirai advances in the tournament. This match is in the 2nd Round of the Cinderella Tournament. Tessa and Storm lock-up to start, Tessa pushes Storm against the ropes and gives her a hard elbow. They both go back and forth off the ropes until Storm boots Tessa in the face, hip attacks by Storm but Tessa blocks the last one and hits a Codebreaker. Octopus Hold by Tessa but Storm drives her back into the corner, she goes for the running hip attack but Tessa moves out of the way. Tessa goes for a German but Storm blocks it and drops her with a leg trap German suplex. Running hip attack by Storm in the corner and she hits a fisherman suplex hold for a two count. Storm grabs Tessa but Tessa blocks the piledriver attempt and hits a cutter. Tessa charges Storm but Storm hits an uppercut, Drill-A-Hole Piledriver by Storm and she picks up the three count! Toni Storm advances in the tournament. Short, but they packed in a fair amount of offense. Tessa has looked a lot better on this tour than the one with Stardom last summer, either she has gotten better in general or has just adapted better to wrestling in the promotion but I’ve been impressed. Storm is a great young wrestler, everything she does is so smooth and she has very limited wasted motion. Not long enough to recommend, but a fine watch. This match is in the 2nd Round of the Cinderella Tournament. After a brief stare down they begin trading elbows, wristlock by HZK but Kairi flips out of it and reverses the hold. HZK returns the favor as they go back and forth trading holds, HZK hops out to the apron to get away and then snaps Kairi’s neck over the top rope. Back in the ring, running elbow by HZK and she hits a second one before connecting with a boot while Kairi is against the ropes. Face crusher by HZK and she puts Kairi in an armtrap crossface, but Kairi gets into the ropes for the break. HZK slams Kairi and goes for the diving senton, but Kairi moves and hits the Sliding D to HZK’s back. Chops against the ropes by Kairi and she delivers a dropkick followed by a neckbreaker for a two count. Octopus Hold by Kairi but HZK gets into the ropes, Kairi grabs HZK and scoop slams her on the mat. Kairi applies the Ikari but HZK gets out of it and rolls up Kairi for two. Spinning backfist by Kairi by HZK fires back with a jumping front kick and both wrestlers are down on the mat. Kairi and HZK trade elbows as they slowly get up, HZK clubs Kairi to the mat and cradles her for a two count. HZK tries covering Kairi again as time is getting short, she picks her up but Kairi blocks the Full Nelson Slam. Kairi elbows HZK in the leg and covers HZK with a bridge, but HZK gets a shoulder up. Kairi elbows HZK but HZK nails her with a jumping kick, she picks up Kairi and hits a Michinoku Driver for two. HZK goes up top and nails the diving senton, she goes up top again but Kairi recovers and joins her. Kairi tries to push HZK out of the ring but HZK elbows Kairi down to the mat, Bombs Away by HZK but the bell rings as the time limit has expired. HZK and Kairi Hojo are both eliminated from the tournament. This match is in the 2nd Round of the Cinderella Tournament. Kagetsu asks for a handshake and Mayu foolishly falls for it, she shoulderblocks Mayu to the mat but Mayu kips up and hits a headscissors. Springboard armdrag by Kagetsu and both wrestlers go for dropkicks with neither connecting. They lock knuckles before Kagetsu slams Mayu into the corner and connects with a jumping elbow. Suplex by Kagetsu and she puts Mayu in a cross-arm submission, but Mayu gets to the ropes to force a break. Kagetsu puts Mayu in the ropes as Hana and Kris Wolf get on the apron to help kick at Mayu, Kagetsu gets Mayu on her shoulders but Mayu slides off. Jumping elbow by Mayu, she charges Kagetsu and dropkicks her while she is against the ropes. Northern Lights Suplex by Mayu, but Kagetsu kicks out. Mayu goes up top but Kagetsu dropkicks her onto the apron, Kagetsu goes up top too but Mayu headscissors her onto the apron also. Kagetsu quickly rolls back into the ring with Mayu following, spear by Kagetsu and she covers Mayu for a two count. Mayu goes for a hurricanrana but Kagetsu blocks it, she tries to drop Mayu onto the apron but Mayu brings Kagetsu over with her. Mayu kicks Kagetsu so she is almost out of the ring, but Hana helps prevent her from hitting the floor. Mayu keeps kicking at Kagetsu however, and eventually Kagetsu falls to the floor, eliminating her from the match! Mayu Iwatani wins and continues on in the tournament. A small step down from the last few matches, but not a big one. Its hard for a sub-five minute match to be bad since most of it was high speed offense, my only quibble is that Hana stopping Kagetsu from hitting the floor was a cute spot that they did nothing with. Mayu just kicked her out anyway. I’d have liked for that to have temporarily saved Kagetsu at least long enough for her to get back on the apron, leading to Mayu doing something with more impact to finally send Kagetsu down to the floor. A good idea by them that was wasted. But I loved the action, Kagetsu is a lot of gimmick in Stardom but she showed here she is a great wrestler as well as she hit everything perfectly. Nothing bad here, just a bit too short and I didn’t love the end sequence. This match is in the 2nd Round of the Cinderella Tournament. They tie-up to start but Havok easily pushes Io to the mat, they tie-up again but they have the same result. Havok chokes Io but Io pushes off of her, she goes for elbows but Havok absorbs the blows. Hard bodyblock by Havok, she picks up Io and goes for the tombstone piledriver but Io gets claps her head with her legs to get out of it. Dropkick by Io, she covers Havok but it gets a two count. Tiger Feint Kick by Io and she hits a swandive sunset flip for a two count. Io goes for the German but Havok blocks it and snaps Io over her knee. Havok charges Io but Io keeps moving out of the way, Io pulls down the top rope to send Havok to the apron but Havok lariats her. Havok grabs Io to bring her out onto the apron with her, but Io gets on Havok’s back and applies a sleeper. While hanging over the floor, so still not an ideal position. Havok slowly starts going to sleep, Io releases the hold and tries to return to the ring but Havok grabs her by the leg. Havok pulls at Io and they both end up tumbling to the floor, making the match a Draw. Both Io Shirai and Jessicka Havok are eliminated. While I do think that Io and Havok could have a good match, this wasn’t it. It started fine, but the last minute or so was garbage. I am not a fan of the “heel stupidly chases the face around the ring” spot, and here it lasted way longer than usual which only made it worse. The idea that Havok would fall for that and then tumble out of the ring is insulting even by normal wrestling standards. Than Io applying the sleeper while hanging off of Havok, while a neat visual, wasn’t very logical. Then they both tumble out to the floor anyway. Sure it helps protected Io, but it just didn’t make for a very good match. Definitely skippable. Since two of the second round matches ended in a Draw, we are going straight to the finals with Mayu Iwatani vs. Toni Storm. 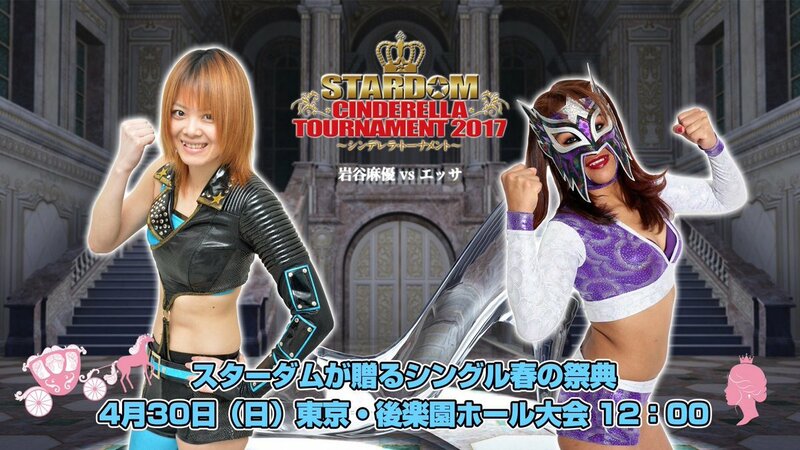 This match is the Finals of the 2017 Cinderella Tournament. Not to toot my own horn but these were the two wrestlers I had with the best odds of winning, so color me not surprised. I will say that I don’t like swerves just for the sake of swerves and the predictable thing isn’t always the wrong thing, it was logical based on storylines for these two to be in the Finals and here they are. 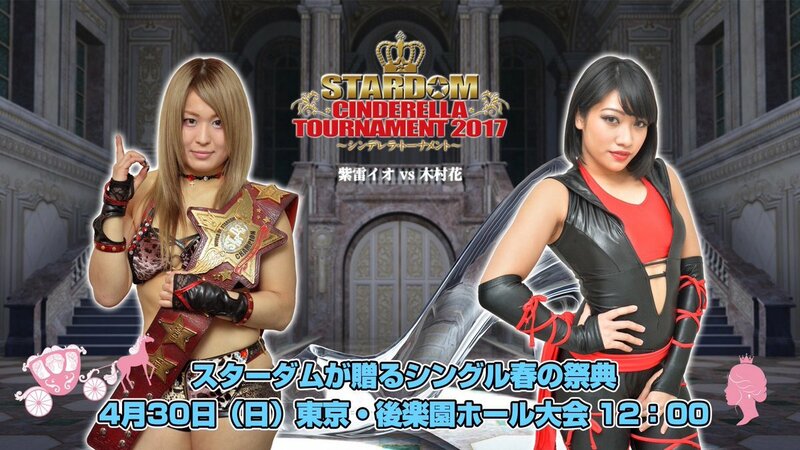 Mayu is looking for the three-peat, while Storm is looking to finally get a title shot that she has long deserved. There is no ten time limit nor Over The Top Rules for this match. Mayu takes Storm to the mat off the bat, but Storm gets away and they return to their feet. Mayu gets Storm down again and they trade holds for a few minutes until Mayu gets into the ropes, Mayu Irish whips Storm and she hits a jumping elbow smash. Slaps by Storm and she hits a snap vertical suplex, she kicks at Mayu’s head before covering her for two. Storm chops Mayu in the corner and hits an uppercut, Irish whip by Storm but Mayu drop toeholds her into the second rope. Mayu goes for a dropkick but Storm moves, sending Mayu crashing out of the ring. Storm quickly goes off the far ropes and sails out onto Mayu with a plancha suicida, she slides Mayu back in and covers her for two. Storm kicks Mayu in the corner and chops her, snapmare by Storm and she gets a two count cover. Storm headbutts Mayu into the corner before hitting a knee, Storm charges Mayu but Mayu avoids her and hits a high kick. Dropkick by Mayu, she goes off the ropes and dropkicks Mayu while she is against the ropes. Mayu goes up top and dives out onto Storm with a diving plancha, she slides Storm back in and hits a missile dropkick followed by a diving footstomp. Mayu goes up top again and delivers the Frog Splash, but Storm reverses the pin into one of her own for a two count. Superkick by Mayu and she hits a Buzzsaw Kick, another superkick by Mayu but Storm blocks the suplex attempt and hits a Stunner. Storm picks up Mayu but Mayu elbows her off and they trade shots, Mayu kicks Storm in the chest but Storm blocks the next kick attempt and delivers a snap German. Running hip attack by Storm in the corner and she nails a reverse neckbreaker, but Mayu springs up and hits a release dragon suplex. Mayu goes up top but Storm avoids the diving footstomp, headbutt by Storm and she nails a snap piledriver, but Mayu gets a corner up. Storm goes up to the top turnbuckle and connects with the Diving Guillotine Legdrop, cover by Storm and she gets the three count! Toni Storm wins the match and the Cinderella Tournament! For an event like this, its better to look at it as an overall presentation rather than individually since so many of the matches were so short. With 14 matches on one card, that is bound to happen. Almost all of the matches were at least fun to watch, with only a few exceptions, and those few exceptions were naturally really short matches so they are easy to get through. There were several really entertaining matches however, with Storm/Mayu. Hana/Io, and Kyona/HZK leading the pack. Top to bottom I’d say this show was a success, its a bit silly having so many matches in one night and I wish they split it up into two nights, but it is still an entertaining show and worth the cost of Stardom World to enjoy.